Located on the shore of Deep Creek Lake, McHenry is nestled in the hills of Western Maryland. With just a short drive from I-68, you’ll find plenty of opportunities for recreation, arts, history, and local shopping. Once a student, we encourage you to step away from campus every now and then, and discover what’s to love in the Appalachian Mountains. 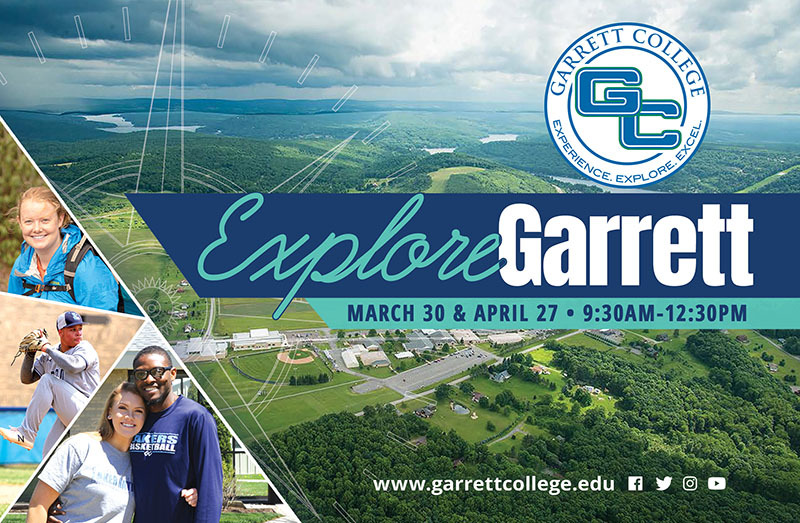 Now that you have learned about the area, come visit Garrett College! While you are here, we will take you on a detailed tour around campus, as well as the Residence Halls. Expect to be on campus for at least an hour and a half. You can meet with Admissions, Financial Aid, and sometimes Faculty (depending on their availability and teaching schedules). Feel free to come prepared with questions. Attend one of our Open House sessions. Click the picture below for more information. All tours will begin at 1:30pm in the Admissions Office. To RSVP submit this form. Please follow the directions on the campus map to bring you to campus. If you are planning to stay overnight, you can find some local accommodations by visiting www.visitdeepcreek.com. We look forward to seeing you soon!